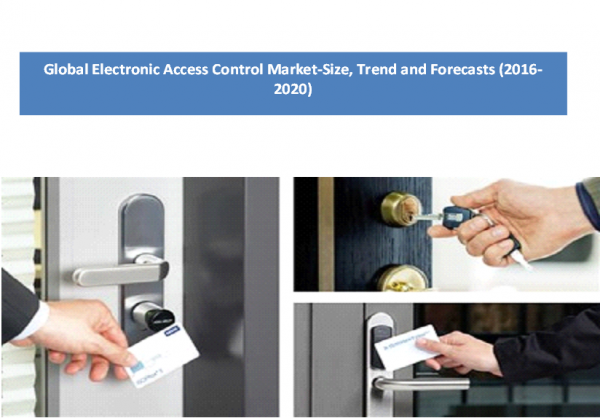 The report titled “Global Electronic Access Control Market Size, Trends and Forecasts (2016-2020)”, provides an in-depth analysis of the global electronic access control market by value, by competitors, by region, etc. The report also provides detailed analysis of the regional markets, namely Asia, Americas and Europe Middle East & Africa (EMEA). Growth of the overall market has also been forecasted for the period 2016-2020, taking into consideration the previous growth patterns, the growth drivers and the current and future trends. The report also includes detailed analysis of leading players in the industry including Assa Abloy Group, UTC Fire & Security, Allegion PLC and ABB Group on the basis of attributes such as business overview, recent developments, financials and strategies adopted by the market leaders in order to ensure growth, sustainability, etc. Electronic Access Control refers to the use of electronic authentication systems for verification of a person’s identity and/or access rights on the basis of some credential such as access cards, passcodes or biometrics. It has numerous advantages over mechanical lock and keys. These are also easy to configure and are capable of keeping a record of each access transaction. Mobile access control is the next major change in the security industry. It marks the advent of keyless era by replacing traditional keys and cards by digital keys that will be created, managed and used via smart devices. It is expected to be widely used in Residential and Government end-user industry globally. Growth of global electronic access control market is driven by increasing popularity of mobile payments, growing safety and security needs and stringent regulation and quality requirements. However, factors such as absence of a common communication protocol, lack of trust on technological security and high cost are posing challenge to growth of the industry. Key trends prevailing in the industries include mergers and acquisitions in the industry globally and rise in residential market penetration. Region-wise, the global electronic access control market is divided into Americas, Asia, Europe, Middle East and Africa (EMEA). Presently, Asia and Americas are the leading electronic access control market, driven by investments in advanced security technologies and rising digitization measures by the government of emerging economies.